Students will learn about the need for rock art to be respected and protected. They will learn about the sacredness of rock art and its link to Utah history, culture and art. Teacher made Rock Art Board using card board or cardstock cut 5''/ 7"
Learning is reinforced when students feel a connection with a concept. Students will create individual "pictographs," a class "rock art panel pictograph," and individual petroglyphs. When their class panel is "vandalized," the students should feel affected. This experience can be used with the vocabulary words from the lesson on storytelling, to teach respect of property, respect for nature, and respect for life. Rock art is all we have left of a "written" history of the Native American Indians who live in Utah. It is important that we protect and preserve this record of history for us and our children. Suppose your pictographs are the only record the future people have of you. What does it say about your community? What would you like to tell them about you? How would you feel if your history was vandalized? When visiting the Sacred Images A Vision of Native American Rock Art Exhibit, discuss the differences between pictographs and petroglyphs. Have students determine which of the panels have symbols that are painted on. Discuss what the artists may have used as paint that could remain after hundreds and even thousands of years. Then have the students determine which of symbols are carved (petroglyphs). Discuss what tools the artists may have used for carving. Return to the classroom and distribute the paper, bleach and swabs. Students are encouraged to "tell" a story about themselves or an important event using symbols similar to those used by the ancient Native Americans. Pictographs should be allowed to dry before students share their stories with the class. Students can decide what story should be told about them as a class, and what symbols they could use to depict themselves and some events that have occurred this year. 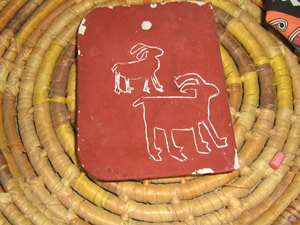 They will create a class panel, using typical rock art symbols, to be hung in the hallway. After a few days, teacher will secretly "vandalize" their panel with spray paint or markers. Have it remain a mystery for a while and use this opportunity for discussion. If using the commercially created rock art Board, have students choose a rock art symbol from the exhibit to "carve" on their individual panel using the stylus included, or pointed sticks (chopsticks work well). For the teacher-made boards, spray each board with the spray adhesive and sprinkle sand or colored salt over the entire surface, covering completely. 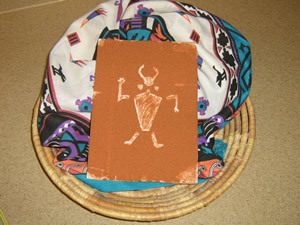 Allow to dry, then students can carve their rock art symbol using pointed sticks or other tools. Prepare the plaster and pour enough of it in each of the meat trays to fill. With a nail, poke a hole near the top in the center so the petroglyphs can be hung when completed. Allow to dry thoroughly before painting the surface with the brown paint. When the paint is dry, students can carve a "petroglyph" onto the surface using a nail or sharp tool.